of 16th Street and route 83. Trunk Show: We are pleased to introduce Fendi eyewear to our collection! Red, Black and Blue – Got a Shiner! Your child may show every sign of good eyesight including the ability to see objects in the distance, however that doesn't necessarily mean that he or she doesn’t have a vision problem. Join us on April 16th as we will display the ENTIRE collection from REVO, BCBG, Mark Ecko and Ocean Pacific! The trunk show runs from 9 a.m. until 3 p.m. We will have light refreshments and a number of giveaways! 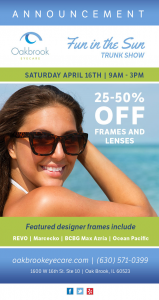 Don't miss this opportunity to receive 25-50% off frame and lenses. 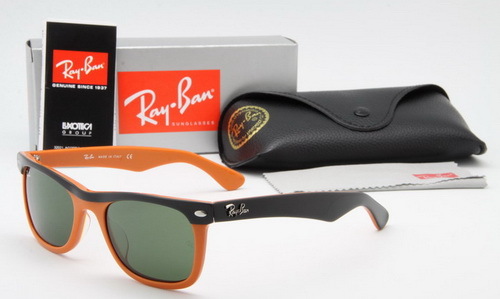 Get ready for summer! March is host to two national vision-related health observances, Workplace Eye Wellness Month and Save Your Vision Month. The first, sponsored by Prevent Blindness America generates awareness for eye-safety in the workplace. According to the U.S. Bureau of Labor Statistics in 2012, there were 20,300 occupational injuries to worker’s eyes which resulted in days away from work. A recent report issued from The Vision Council reports that 70% of adults reported they’ve experienced digital eyestrain from increasing use of computers, tablets and smartphone screens. Trunk Show for Breast Cancer was a huge success! We would like to thank all our patients who attended our Pretty in Pink Trunk show. We happily donated $1000.00 to Hindsdale Hospital's Breast Cancer Outreach program. October 10th from 10:00 a.m. to 3:00 p.m.
25-50% off Frames and Lenses with an ADDITIONAL10% donated to Breast Cancer!! 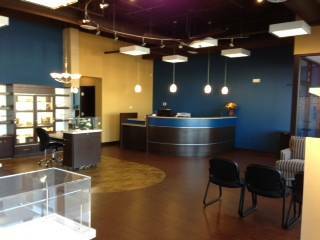 With Each pair of glases purchased at our office, Dr. Franceschini will donate $5.00 to Optometry Giving Sight!! Projects are designed to TRAIN, ESTABLISH and DELIVER. On May 31st, our office participated in a 5K race supporting Answers for Emmett! The race benefits SUDC - sudden unexplained death in childhood (SUDC), which occurs when an apparently healthy child beyond the age of 12 months dies without warning and without a known cause. Dr. Franceschini and a few hundred cyclists rode the hills of Napa in support of the Davis Phinney Foundation for Parkinson's. Dr. Joe is was on Team Boitano and is pictured below with former Olympic Champion: Brian Boitano. March 14th – Save the Date! Please come to the office as we unveil our new frame line - Tom Ford Eyewear! During the month of March, the American Optometric Association would like to remind Americans of all ages of the importance of eye health and regular exams. On average, more than nine in 10 adults (93.3 percent) spend more than two hours each day using a digital device, with more than six in 10 adults (60.8 percent) spending five or more hours on digital devices each day. 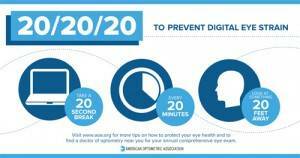 Whether it's for work or play, using computers, smartphones, tablets and e-readers TV or video games, all that time can take a toll on the eyes and lead to digital eye strain. 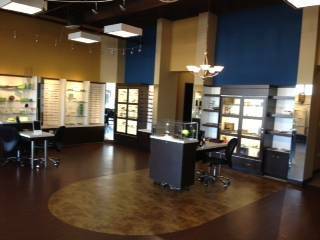 Trunk Show: April 24th from 4:00 p.m. to 8:00 p.m.
February is Macular Degeneration Awareness Month! Macular degeneration is a major cause of visual impairment in the United States and around the world. Macular degeneration is a major cause of irreversible vision loss in the United States and around the world. As many as 11 million Americans have some form of macular degeneration, including both early and later stages of the wet and dry forms. We urge everyone to regularly get comprehensive eye exams. Doctors at the Massachusetts Eye and Ear Infirmary in Boston reveal an increase in patients complaining of sore eyes, blurry vision, headaches, and muscle strain — and only after consultations do they realize that it is related to excessive use of smartphones, among other computer devices. Though scientists have introduced some inventions that can turn smartphones into reading aids, most people are at risk for the dangers these devices pose for their eyes.